Which was hardly eaten because he was too hyper to concentrate on eating, but it got demolished when we got home. A portrait after school with the school noticeboard. He had a great day, and decided to go back again tomorrow. And we instituted a new family tradition. If one of us has something to celebrate, like a major milestone of starting big school, they get to eat dinner off the blue plate. At his request, pasta and red sauce, his favourite meal. At my insistence, we also had salad, and zucchini, mushroom and eggplant in the sauce, fried in butter. It was yummy, and it was demolished. Though he didn’t quite have enough room to finish dessert – fruit salad with mango, nectarine and orange. This morning, we did it all again. We were so organised, we made it to school 30 minutes early! Can you spot his Squishyness? 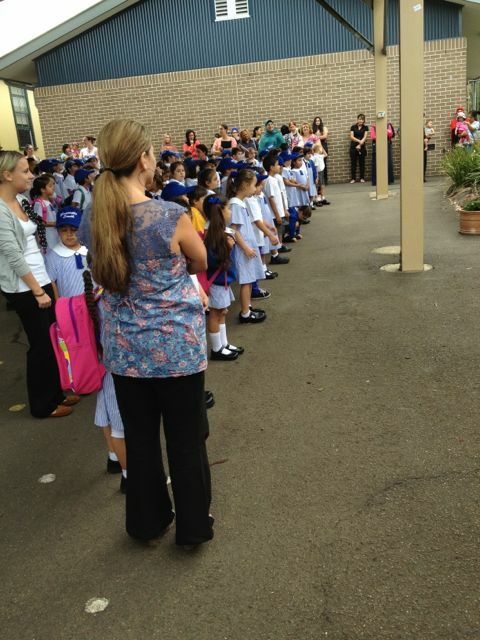 Amongst all the kindy kids standing tall and paying attention, there he is, crouching down and being a ratbag. I’m glad it went well and he wants to do it all again. First day of school all I heard was, “I don’t like my teacher. She doesn’t like me. And I’m not ever going back again!” Needless to say, every day was a fight after that! And yes, she loved pre-school!